Welcome to our Ischia blog, Good Morning Ischia! Here you can see the entry for Tuesday 7th January 2014. We've got another beautiful day in Ischia, standing outside just a moment ago it once again felt like spring with fresh, clean air and a warm breeze. Looking out to sea there's a calm blue surface with just a few seagulls disturbing the eye's gaze while in the other direction Mount Epomeo majestically takes command of the landscape, the bright sun reflecting off the windows as a car makes its way around its twisting road towards Serrara Fontana and in the distance the sound of agricultural machinery symbolises the return to work after the festive period. Temperatures today should see a maximum of 15° Celcius (59° fahrenheit) dropping no lower than around 13°C (55°F) and the outlook for the next few days is for more of the same, a real winter weather bonus! Today's photo is from Ischia Porto, showing the harbour in its full resplendent glory. 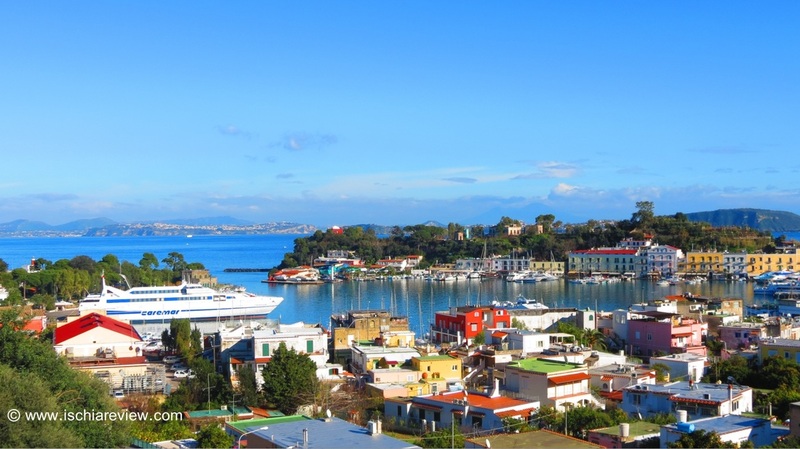 The harbour area is the first place that most visitors to the island first set foot on as it's the busiest of Ischia's three ferry and hydrofoil ports, the others being Casamicciola and Forio. For anybody staying in accommodation away from the island's capital, you'll see this same view after just a few minutes of your journey as you transfer away from the port towards your hotel, apartment or villa. The main road heads west and then climbs a steep hill where if you look to your right you'll see this great view below. Looking out the same window you'll also catch a brief glimpse of the magnificent Castello Aragonese before the road straightens and heads towards Casamicciola. Some visitors choose to take a ferry or hydrofoil to Casamicciola if it's closer to their destination on the island. There's little or no difference in journey times and prices and if you're staying in towns such as Lacco Ameno or Casamicciola itself then it's a good idea to try and find a crossing there as you'll save a bit of time at the other end as well as some money if you're planning on taking a taxi on arrival. The final option for your arrival port is Forio. The port of Forio is served by hydrofoils from Naples but unlike Casamicciola and Ischia Porto, doesn't have a ferry terminal. You pay about €6 per person per journey extra for the hydrofoil but it's around half an hour faster than the ferry. The extra money you spend on the hydrofoil could well save you the same or more if you are staying in Forio or even further along in Panza or Sant'Angelo. We've got details and advice about all of the various crossings on our ferries and hydrofoils timetable page where you can work out the best way for your particular circumstances. You can now also buy tickets on-line with us in advance of your journey if you'd like to be sure about exactly which crossing you'll be taking and to make sure you secure your space. If at any stage you're not sure what your best options are then you can always drop us a line and we'll be happy to point you in the right direction. Ok that's all from me this morning, I think I'll get out into that sunshine now!